An automatic hen house door opener and closer is very useful for anyone who keeps hens and cannot guarantee they’ll be able to manually open or close the door every day. Simple systems have a light detector and the door is opened at dawn and closed at dusk. More advanced systems have a programmable timer which in most cases is preferable since you can then set it to open the door later in the morning if the (free range) hens are laying eggs all over the place, or if you want to stop a cockerel waking up the neighbours early in the morning! Retail hen house door openers / closers retail at over £100, so the DIY option is well worth considering. Many people have managed to put something suitable together typically using a windscreen wiper motor or an electric car aerial to lift and lower the door, but then hit on the problem of how to reverse the polarity of the motor so that the door can be opened AND closed. NEW 2013 Update – Click here to view details of our latest Simple Hen House Door Controller which uses limit switches and a better motor than that discussed below. 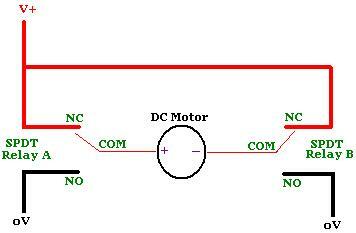 Simple DC motors such as windscreen wiper motors (pictured above) will rotate forwards (clockwise) with the + and – leads connected with the correct polarity, and rotate backwards (counter-clockwise) with the power leads reversed. This is perfect for this type of application since we want the motor to spin one way in the morning to open the door, and then the other way to close the door. It is not until you actually take a couple of relays and a motor and you try to wire them up so that if relay 1 is energised the motor spins forwards, and if relay 2 is energised the motor spins backwards, that you discover that everything is not quite as simple as you might imagine. It is very easy to end up causing a potentially dangerous short circuit at worst, or for the system to just not work at best. In the rest of this article we will focus on one method of getting around the problem of reversing the polarity of a motor using two relays. Above is shown a schematic diagram using a couple of SPDT (single pole double throw) relays. As presented above, neither relay is energised (as will be the case the vast majority of the time) and the motor will not turn since both power inputs are connected to V+. Similarly, if both relays are energised (eroneously), the motor will also not turn since both power inputs are connected to 0V as shown below. It is common to connect a small capacitor (e.g. 10nF) and a resistor (e.g. 100 Ohms) in series across the DC motor to protect the relays from the high voltage pulse released when the motor stops spinning. With everything connected as shown above, all that remains is to connect the motor to a pulley which will pull up the door in the morning, and lower it in the evening, and an electronic controller to manage everything. Such a system is ideally suited to be powered with a photovoltaic solar panel since very little power is drawn on average through the day since the motor is used for just a few second twice per day. A small solar panel (1-3 Watts) and 12V battery will be more than adequate, and could also be integrated with a Poultry Lighting System during the darker months to promote frequent laying. If you are interested in purchasing a 12VDC controller circuit board including two relays wired as above please email neil@reuk.co.uk. You can choose between a modified programmable digital timer which will open the door at a fixed time every morning, and then close it X hours later, or a more basic (and of course cheaper) circuit with a light detector which will open the door at dawn and close it again at dusk. All we need to know is how long you need to run the motor to fully open the door, and how long to fully close it again. Prices start from around £25. 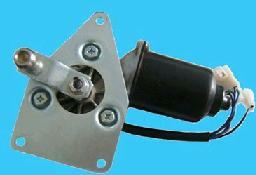 Click here to purchase a used or new windscreen wiper motor from ebay UK for as little as £0.99. It is also possible to purchase complete automatic hen house door systems there for around £100. My chicken shed door works really well. Managed to do it with old car shock absorber (as a ram), 12V compressor (£6 from Halfords), and using one timer with two headlamp relays and two car door light switches (to de-power relays when door fully open or closed). Uses minimal power.